Be the first to share your favorite memory, photo or story of Julius "Jay" . This memorial page is dedicated for family, friends and future generations to celebrate the life of their loved one. 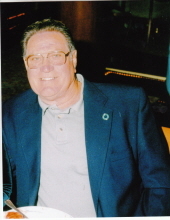 Julius "Jay" W. Walden, 83, lost his valiant battle of 8 years with Parkinson's Disease on February 2, 2019. Jay was born September 19, 1935. Survived by wife, Myrna K.Walden; three children: Lorrie Newton, Julie Johnson, and Steven Walden; four grandchildren and four great grandchildren. Jay grew up in Laguna Beach, California and at 17 joined the Army for three years and nine months. After discharging he married Sally and had his three children. They were married 21 years before divorcing. They resided in Garden Grove, California during their marriage. Jay was employed by the Federal Government working at Long Beach Naval Shipyard as a Master Mechanic and later became a Cost Analyst for the Navy and Federal Government for 35 years, retiring in 1991. He married Myrna on January 12, 1999 in San Diego, California where they lived until 2002 and moved to Coeur d' Alene, Idaho, where Myrna grew up. Jay was employed at Home Depot for two-three years after retirement. He was very skilled as a carpenter and did a lot of handyman work remodeling friends' homes. He had so many friends and was very sociable! A memorial service for Jay will be held at Yates Funeral Homes, 744 N. 4th Street, Coeur d'Alene, Idaho on Friday, February 8, 2019 at 10:00 AM with a reception to follow. To send flowers or a remembrance gift to the family of Julius "Jay" Walden, please visit our Tribute Store. A reception will follow at Yates Funeral Home. "Email Address" would like to share the life celebration of Julius "Jay" Walden. Click on the "link" to go to share a favorite memory or leave a condolence message for the family.